High Stakes Poker was a cash game poker television program broadcast by the cable television Game Show Network (GSN) in the United States. It premiered on January 16, 2006 and ended on December 17, 2007 for the first 4 seasons and the last 3 seasons ran from March 1, 2009 to May 21, 2011. The poker variant played on the show was no limit Texas hold 'em. The show was taped in a poker room setting at various casino hotel locations in Las Vegas, Nevada. 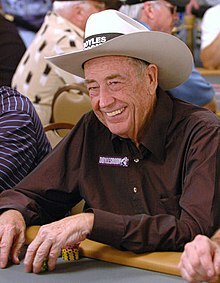 The participants on the show included both professional poker players and amateur players, including celebrity amateurs who have had some success in major tournaments, such as Jerry Buss, Sam Simon, Nick Cassavetes and others. ^ Jenkins, Tom (2009-04-22). "Antonio Esfandiari Does 47 Pushups on High Stakes Poker". Poker News Daily. Retrieved 2009-06-13. ^ Feldman, Andrew (2009). "Chat with Andrew Feldman, Barry Greenstein". ESPN.com. Retrieved 2009-06-13. ^ "Mike Baxter - Poker on NBC". NBC Sports. Retrieved 2009-06-13. ^ a b "High Stakes Poker on GSN". pokerbaron.com. Retrieved 2009-06-13. ^ "Dr Amir Nasseri". ixgames.com. 2008-06-13. Retrieved 2009-06-13. ^ "David Peat - Poker on NBC". NBC Sports. Retrieved 2009-06-13. ^ "Surfin' Safai". Poker After Dark. Retrieved 2009-06-13. This page was last edited on 29 November 2018, at 18:46 (UTC).